The duvet cover is slightly bigger than the comforter. But I like it ive had it for a year now. I really like the navy blue color. It matches my headboard very well. It also does a great job keeping me warm. We had only electric heating in our house so we wouldn't keep the heat up because it was expensive so alot of lights were really cold and this helped me stay warm. This effortlessly luxurious Superior Down Alternative Comforter offers uncommon style, comfort, and high quality. Both hypoallergenic and made of down alternative microfiber, this 230 thread count comforter lets you kick back and relax in the soft comfort you deserve. A gorgeous 3-piece cotton duvet cover set completes the stylish collection. Disappointed that the California King comforter/ duvet cover that I specifically ordered for the hard to find size was delivered with a King size comforter and California King duvet cover - proportions and measurements did not match eachother wich I noticed before opening but was told by customer service that the right item /size was shipped-so neeedless to say ,I have a duvet cover that is not completely filled by the smaller comforter insert leading to a messy , awkward look. I would not recommend this product if you are truly looking for a California King comforter. It took me a few weeks to finally order this comforter/duvet set, as I did a lot of research and checking out of peoples' reviews of products. Typically, you don't see many positive reviews of items, which always baffles me. People always have something to complain about it seems. I can't say anything negative about this product and I am very happy I ordered it. I love this comforter/duvet set. It is very soft, squishy and comfortable and keeps me warm at night. The color is very pretty, I ordered the taupe one. It looks great on my bed and covers it just fine. People recommended ordering a size up but this fits fine on my queen bed, doesn't hang to the floor but covers enough of the sides. You can't beat the price, considering you are getting a comforter, a duvet and two pillow cases, which are very pretty as well. I would recommend this product to anyone. It definitely keeps you warm, sometimes I get too warm and have the fan running or just sleep with shorts and a t-shirt and melt away in my bed. The quality of the bedding itself is great, but it doesn't fit my bed. Although the online description states the comforter is big enough for an over-sized king bed or California king, the duvet cover is only 97 inches wide, almost 10 inches narrower than described online, leaving the sides of my mattress exposed. Also, I ordered the duvet cover in taupe expecting it to be a medium shade with grey undertones, but it's much darker with brown undertones. Ok, let's admit it. You are not going to get Frette quality for this price. But, I was pleasantly surprised by what I did get. The comforter is very warm and definitely for cooler weather. I live in CA and can't imagine using it in the summer. It fit's my Cal King fine on the sides but is a bit short under the pillows. The duvet cover set looks and feels soft, but wrinkles easily and tends to look more casual than the crisp clean look when it is first ironed. Overall, nice quality and worth the price. I am so pleased with these items. The comforter has great weight and the feel of down even though it is alternative. 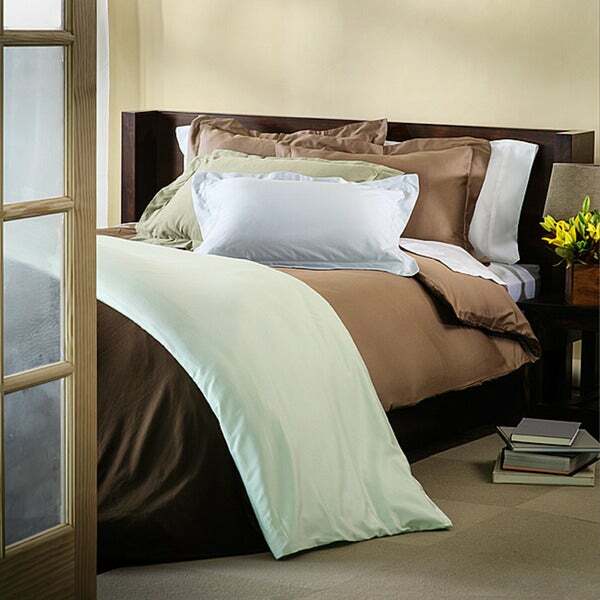 Love the material the comforter is made of - super soft and smooth. Was pleasantly surprised by the color of the duvet and pillow shams - they are more gray blue then baby blue and have a beautiful sheen and luxurious feel. Couldn't be happier - a fabulous deal on a four pc.set. Wish I was using them in my master bedroom instead of the guest room - lucky guests! I was a little nervous about ordering this because no one else had left a review, but I'm glad I did! The comforter itself is very nice-fluffy! And the fact that you get o pick a duvet cover to come with it was the best! I ordered the black cover, which most would find boring, but if you throw a bunch of bright, sparkly pillows on the bed, the black looks great! I would reccomend it to anyone!! The comforter itself is super-soft; if I wasn't the clutz that i am, i would probably just forgo the duvet cover altogether because the comforter is amazing all on its own. The fact that i basically got the duvet cover for free, though, was a much appreciated bonus. I ordered the red cover, and it matched the image i saw on the screen prior to purchasing it. It isn't as soft as the comforter, but it is still incredibly comfortable. For all pet owners whose pets go on the bed - get in the habit of lint rolling the duvet cover every few days. I waited a week and a half, and the amount of pet hair on the bed took over a half hour to lint roll off. Having just purchased a new bedroom set, I wanted to upgrade my bedding to a "real" duvet and cover set. I've always had great fortune with bedding purchases on Overstock, and this time was no different. The duvet is very soft and very warm, and the high-TC cover feels luxurious. Overall thickness is moderate--my boyfriend's high-loft real down duvet does put it to shame--but for my first duvet, this is quite nice and I anticipate it lasting a long time. If you don't require a hugely "poofy" duvet, this will surely serve you well. This is my 1st try of a down alternative comforter. It is heavier than the down but not too bad. This comforter is pretty warm for the NW region and I liked the feel of the alternative down. The bonus duvet cover is ok and when I purchased the comforter I didn't have much choice of the colors. I wish Overstock would have better capability to have the product zoom in with different scales for potential customers to view and get a better feel for the material and colors. Overall, my purchases from Overstock offered quick shipping and satisfaction so far. This is a very nice and soft down alternative comforter, and the duvet cover is lovely too. The price is excellent for the quality. Order came quickly and upon receiving what I liked was the size and weight (I needed smaller as this is in a motor coach) The color is a DARK taupe that wasn't an issues for me. Upon putting the comforter in the duvet, ever other button hole had to be opened up to allow the button thru, I may have to hand sew those edges in the future after washing. Comforter is warm, comfy, and huge! It took two of us to get the cover on. I would recommend! As soon as I received and opened the package I feel even more in LOVE with this set! The rich color is amazing, the cover is perfect for my Cal King, just warm/cool enough! Very luxurious feeling comforter and duvet. The kids all gather on our bed and everyone loves the fluffiness and feeling. The comforter came faster than expected and exceeded our expectations. We even got two because these are relatively lightweight and just right fit a bit over the edges. Not sure if so "oversized" though, to tell the truth. Certainly not like picture. This was a convenient way to provide my 20s-something daughter with bedding on the go. I love this on my king size bed! Beautiful! BEAUTIFUL, EGGPLANT COLOR IS PERFECT AND LOOKS ELEGANT ON MY BED! got this in brown for my son's bed. he loves to be warm at night, and this keeps him very warm and cozy. it doesn't feel overly heavy for the degree of warmth it provides. Bought this for my 12 year son's bedroom. Very high quality. Warm but not too hot. He uses this set during the winter and summer and he is very comfortable all year around. Highly recommend. Love the price! "Is this a true Egyptian Cotton or is it a sateen finish? In the photo that shows the colors the duvet it seems to have a shiny sheen to it. Thank you." I would not say the surface is shiny, no. it does have a slight sateen finish, but feels like 100% cotton-was very pleasantly surprised-since the duvet cover never directly touches me,it would not have made a difference to me-comes out of the dryer with no wrinkles and for the money, this product cannot be beat. "Is the conforter for winter? Or could I use it also in summer? I live in Mexico City, and here is like if it's always spring." This comforter is light and it could be used in the summer. "Hi, I want to make sure of the exact sizes for the California King of both the duvet and the cover. There has been some comments of the duvet being much smaller than the cover. Thanks." The california king duvet dimensions are approximately 106 inches wide x 92 inches long. Thanks for shopping with us! "Can you use the comforter without the duvet cover? Im thinkn i can get a two for one deal hear, use the comforter as is which is white, then to switch it up throw on the duvet cover. But is the comforter itself okay for that? Is it just like any other comforter or is it itchy or any other issues? Is it soft, super soft,or the duvet needs to be used?" You can use the comforter with out the duvet. The comforter is very soft. There is a picture of the comforter under the large picture. Have a great day! "what is the fill in ounces of this duvet?" The fill in each comforter is as follows: Twin/Twin XL: 60 ounces, approx 6lbs, Full/Queen: 77 ounces, approx 8lbs, King 100 ounces, approx 10lbs. "does this set have corner ties to tie the insert to the cover?" This duvet cover does not have corner ties for the comforter.